Synopsis: Kimberlee Schaffer may be drop-dead gorgeous... but she also dropped dead last year. Now she needs Jeff's Help with her unfinished business, and she is not taking no for an answer. 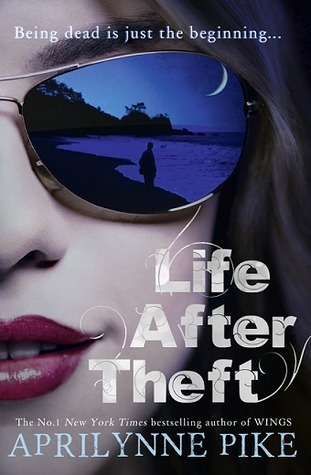 When she was alive, Kimberlee wasn't just a mean girl; she was also a complete kleptomaniac. So if Jeff wants to avoid being haunted until graduation, he'll have to help her return everything she stole. But Jeff soon discovers it's much easier to steal something than it is to bring it back. What I thought: This book had so much potential and yet I just don't think it was that great. Kimberlee was everything you expected in a mean girl, and to top it off, was a crazy klepto. She didn't really seem to have any redeeming features, and she didn't make any self-changes until the second last chapter when it didn't really matter anymore. Jeff is supposed to be helping the ghost of Kimberlee return all the things she stole. I thought this would be a story about a few stolen things, and the meaningful ways they were returned, but it wasn't. It was about a hundred stolen things and the ways Jeff and some new mates could offload them the quickest, in hopes of getting rid of Kimberlee as fast as possible. That sounds like it should have made a fairly good story? Yeah well, to me the fact that Jeff and his relationship with Sera really overshadowed all that. Kimberlee has history with Sera, and this constantly causes friction between Jeff and the ghost. The whole story is dragged out, with the feeling that Sera has some big secrets, which she has, to bring her down, which they don't. The whole time I was waiting for something to come up that gave Kimberlee a reason to be so nasty to her and yet there wasn't really anything at all. It's a fast read, with a lot going on, but if you like ghost stories then I'd give this one a go. The Good: They were pretty creative in giving back the stolen goods. The Bad: I felt there was so much build up throughout the book and it just fell flat.